In 2016 I purchased the most charming tiny house in the Water Hill neighborhood of Ann Arbor. Upon entering, my absolute favorite room was the entryway. It was so open and bright and welcoming. It instantly gave me a good vibe. After purchasing the house, I spent the next year giving it a full facelift. I basically gutted the first floor, but left the entryway as it was. It really didn’t need much work; just a fresh coat of white paint initially did the trick. After moving into the house, I started brainstorming different ways to better showcase that gorgeous entryway. Although it was still bright and welcoming, it seemed to lack personality. It is a particularly challenging space to hang art, so it basically remained a blank slate of white walls. I decided that I wanted to install wallpaper and obsessively started looking at patterns. 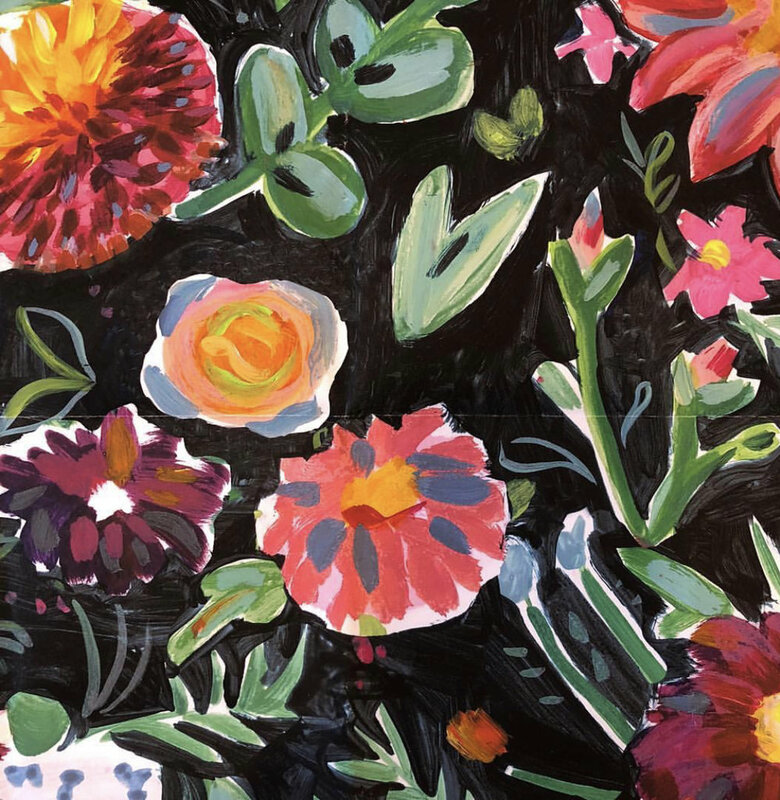 While searching for wallpapers, I came across a pattern that my dear friend, Kimmy Scafuro, had designed for Anthropologie. It was a beautiful painted floral design on a dark background. I decided that that pattern was the winner! I loved it! I reached out to Kimmy to tell her that her wallpaper was the one and jokingly mentioned that if she was up for hand painting a similar pattern on the walls in my entryway in a mural form, I would be game. She laughed at the thought and we moved on from the discussion. About a week later, Kimmy reached out and said that she was up for the challenge and wanted to paint a mural in my home. In preparation for the mural, I created a Pinterest board of all of my favorite flowers and plants: peonies, anenomies, poppies, nasturtium and more. Kimmy started making a collage with those photos and slowly coming up with a pattern that she liked. She then painted a large-scale draft of the pattern on paper so we could get the color palette and flower placement correct. After a few tiny tweaks, we landed on the design that we both loved. Kimmy then came to Michigan and painted daily for a week straight. Mural painting is very time consuming and body straining work! We had initially planned to have the pattern go all the way up the stairs to the second floor, but once Kimmy started painting we quickly realized that that plan was not realistic. We decided to have the pattern phase out as it approached the stairs. The finished product is beyond magical. My entryway finally has the charm and quirk that it deserves. I have a bright, cheery flower garden blooming year round. I am especially excited to have this in my home during the dark and gloomy winter months in Michigan. A pop of bright color to brighten the gray days. Most importantly, I have a one of a kind, original work of art painted by one of my dearest friends. How cool is that?